For detailed information about the TRAC Road Racing series see the TRAC Website. TRAC (The Road-Racers of Atlantic Canada) Series is the regional road racing series put on by Atlantic Region Motor Sports (ARMS) at Atlantic Motorsport Park in Shubenacadie, N.S. It features cars in various sedan classes and open wheel classes. Each race weekend consists of four sedan races (each part of a different championship) and three open wheel races with cars in the Formula Ford and Formula Libre classes. 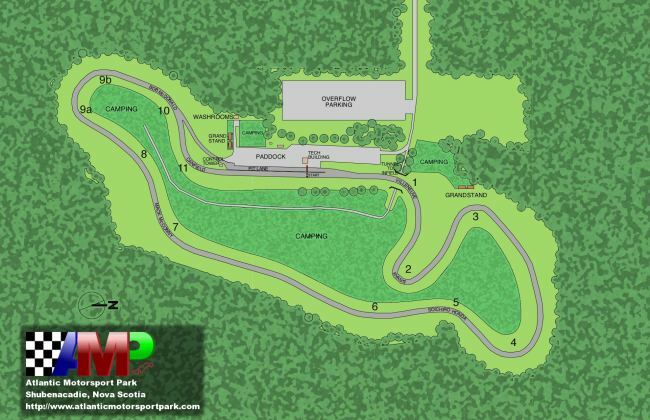 All Road Racing in Atlantic Canada takes place at the purpose-built Atlantic Motorsport Park facility in Shubenacadie, Nova Scotia. One of AMP’s greatest challenges is the downhill “dog-leg” through corners 1 and 2, followed by the roller-coaster ride through corners 4, 5 and 6. It is highly regarded as one of the most technical circuits in the country, and provides a challenging learning experience for both novice and advanced drivers alike. 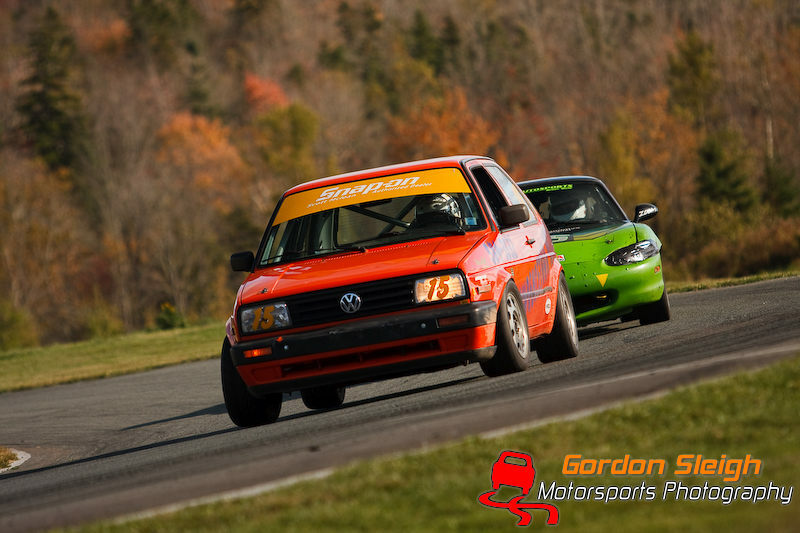 The TRAC Series runs four distinct sedan series’ at each event: the Grand Touring (GT) series, the Improved Touring series, the Atlantic Challenge Endurance series, and the Unlimited series. They also run an open wheel series, featuring Formula-type cars. Grand Touring Sprint Series A and B races are 15 laps with awards are given in each class — GT1, GT2, GT3, GT4, GT5, and GT6 for the top finishers. Atlantic Challenge races are one hour long each, with cars in all classes running. Awards are given for each class in this series. Unlimited Series races are 15 laps, and in these races, class doesn’t matter. Awards are given for best overall finishers, regardless of their class. Open wheel races are 10 laps each, and awards are given to top finishers in each formula class. GT1: Any purpose built tube-frame (or semi-tube frame) race cars or highly modified OEM production Sedans having an engine displacement of 2.5L (and larger). Race car must include standard safety items as well as a fuel cell, fire suppression system and a more extensive roll cage. Slick tires are allowed. GT2: Any purpose built tube-frame (or semi-tube frame) race cars or highly modified OEM production Sedans having an engine displacement of 2.49L (and lower). Race car must include standard safety items as well as a fuel cell, fire suppression system and a more extensive roll cage. Slick tires are allowed. GT3: Overbuilt OEM Production Sedans with a stock unibody. Engine swaps, lexan windows and various other modifications are allowed. Race car must include standard safety items. Although fuel cell & fire suppression system are not required, they are recommended. Slick tires are allowed. All SCCA ITR, ITS, ITE legal cars are in this class. GT4: Production based Sedans that include minimal modifications as indicated in the SCCA ITA Class. Race car must include standard safety items (fire extinguisher, 6-pt roll cage, master electrical shut off, etc.). GT5: Production based Sedans that include minimal modifications as indicated in the SCCA ITB Class. Cars in GT5 class have slightly less performance potential than those in GT4. Race car must include standard safety items. GT6: Production based Sedans that include minimal modifications as indicated in the SCCA ITC Class and/or any entry level racecar. Cars in GT6 class generally have slightly less performance potential than those in GT5 class. Race car must include standard safety items. Open Wheel: Open Wheel classes are split into Formula Ford 1600 (FF), which includes all Ford 1600 powered open wheel cars (with limited engine modification), and Formula Libre (FL) which is a catch-all class for other open wheel cars 2.0L of displacement and under, and those with extensive modification. Legends: Legends cars are small tube-frame chassis built to look like 1930’s-style cars, with a 1200cc Yamaha motorcycle engine. Locally, Legends cars are commonly raced at oval tracks, but they are quite successful on road circuits worldwide. Legends cars are governed by an international set of rules that standardizes the cars and allowed modiﬁcations. Spec Miata: New for 2011 is a Spec Miata class sponsored by Toyo Tires. SM cars are 1st (1990-1997) and 2nd (1999-2004) Miatas prepared to a specified equal level including suspension, brakes, safety and engine output. Spec Miata class cars have their own race for the Spec Miata series and also run the other races of the TRAC series in the GT5 class. For more information on the Toyo Tires Spec Miata Champsionship see their website at http://www.specmiatachampionship.com/.